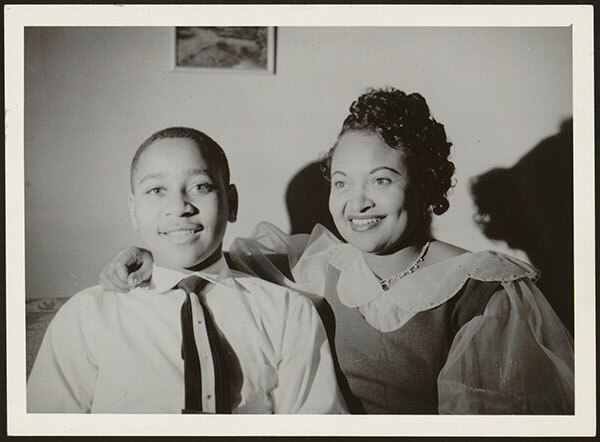 A portrait of Mamie Bradley and her son Emmett Till. Source: Library of Congress Prints and Photographs Division. It was in this climate of terror that 15 year-old Emmett Till was brutally mutilated and murdered in Money, Mississippi on August 28, 1955. The teenage Chicago native had been sent with his cousin to spend the end of the summer with his great uncle, Moses Wright, in the small town on the Mississippi Delta. Just days after arriving, Till joined some of the other children as they went to buy candy and soda at the Bryant's Grocery and Meat Market. Following a brief interaction with the wife of the shop owner, Carolyn Bryant, which has typically been described as the Chicagoan teenager whistling humorously at her, Till and the other boys left the store. Three days later at about 12:30 a.m., Mo Wright was awakened to the sound of knocking on his door. He answered to find Roy Bryant and his brother, J. W. Miliam, at the door claiming that Till had assaulted Bryant's wife, grabbing her and making sexually suggestive remarks. They demanded that Wright hand over the boy, and Wright, knowing that all of their lives were at stake, did so, believing they would do little more than scare the young man. The next day, the boy was missing. Word spread quickly that the young Till was missing and soon NAACP civil rights leaders Medgar Evers and Amzie Moore had relocated to collect evidence on his disappearance. The search party found his body in the Tallahatchie River, just north of Money. The young man had been beaten beyond recognition. The only identifying evidence was a small ring that Till's mother, Mamie, had given the boy before his trip to the Deep South. After the body was identified as that of Till, he was put in a sealed box for burial. Mamie Till refused to allow the body to be buried in Mississippi, claiming that the state had a moral responsibility to return the body to her in Chicago. The state did so, on the condition that the funeral home would leave the coffin sealed. Mrs. Till refused, saying the world needed to see what had been done to her son, and so the body of Emmett Till was displayed in an open casket funeral. More than 50,000 people attended the wake. Mamie Till's actions in showing the body, and pictures of it subsequently published in Jet Magazine, inspired outrage and indignation from people around the world, and especially in the North, where the overt racial violence of the South had been easily ignored. Although the all-white, all-male jury acquitted the killers of all responsibility in the murder, demonstrating the close collusion of the judicial system and the law of vigilantes as enforcers of racial oppression, the courage of Mamie Till and Mo Wright, who testified against the Bryants, inspired action across the world. This picture was taken before Emmett left for Mississippi, 1955. Source: Library of Congress Prints and Photographs Division.